Safe, serene and stress-free, Mulga Bicycle Tours offers guided fully supported small-group bicycle tours. Bask in the beautiful scenery, savour delicious food and wine, discover unforgettable stories and relax in top-notch accommodation. At Mulga, they organise and carry everything. All you have to do is ride. Their two connecting Queensland bicycle tours will take you along the Great Inland Way to Carnarvon Gorge and then, if you wish, across Cape York to the celebrated Karumba sunsets over the Gulf of Carpentaria. Passing through some of outback Queensland’s most spectacular landscapes these guided bike tours will provide you with an Australian cycling holiday you’ll never forget. You won’t ‘rough it’ on a Mulga Bicycle Tour. Delicious local produce, comfy beds, and a focus on safety (not on beating the clock), ensures a smooth ride for all their guests. And with a fully-stocked support vehicle following every day, there’s the comfort of knowing all your food, luggage and other necessities are right behind you whenever you need them. The support vehicle is also there any time you want a break from pedalling, so you can cycle as much or as little as you please. For details visit the Mulga Bicycle Tours website. An outback experience of a lifetime, cycling across Cape York from sea to sea. Journey through a range of landscapes – from tropical rainforest to mountains and savannah - as you cross Australia’s iconic Cape York. This multi-day bike tour is a once-in-a-lifetime chance to accomplish something most people only dream of – crossing the northern most tip of Australia - with each leg carefully planned to be achievable for the average cyclist. With a bit of luxury, small groups, expert support and a firm commitment to safety, you’re in for a unique and memorable experience with Mulga Bicycle Tours. Some of the tour highlights include visiting Ravenshoe, Queensland’s highest town, exploring the lava tubes at Undara Volcanic National Park, riding the Gulflander train, one of the world’s ‘must-do’ rail trips, tasting delicious fresh seafood from the Gulf of Carpentaria. Enjoy 11 days and nights (including two rest days) with overnight stays in Yungaburra, Ravenshoe, Undara, Mt Surprise, Georgetown, Croydon, Normanton and Karumba, and daily distances from 53 to 94 kilometres. If you’ve ever dreamed about cycling across Cape York, here’s the perfect way to get started. Visit the Mulga Bicycle Tours website to find out more. A Queensland cycling adventure like no other. A 10-day biking journey from Cairns to Karumba, complete with spectacular scenery, intriguing wildlife and plenty of fascinating stories to keep you company. This journey through Tropical North Queensland makes for an envy-inspiring Australian cycling holiday; one filled with diverse landscapes, intriguing wildlife, clean fresh air and endless blue skies. From Cairns and the beautiful tropical coast, through wet and dry rainforest, across the savannah and over winding rivers, this cycle tour offers diverse and incomparable experiences at every turn. Just think how satisfied you’ll feel after crossing the northern most tip of Australia. Each leg is carefully planned to be achievable for the average cyclist, and with small groups, delicious food, comfy beds and a focus on safety, you’ll be in good hands with Mulga Bicycle Tours. Enjoy 10 days and nights with overnight stays in Yungaburra, Ravenshoe, Mt Surprise, Georgetown, Croydon, Normanton and Karumba, and an average daily distance from 53 to 94 kilometres. If you’ve ever dreamed about cycling across Cape York, here’s your chance. Visit the Mulga Bicycle Tours website to find out more. Soak up the natural and cultural diversity of inland Queensland on this exclusive bicycle tour along the Great Inland Way. 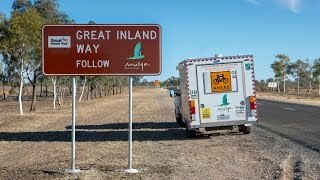 This fully supported 11 day bike tour starts in the peaceful town of St George and journeys north along the Great Inland Way to Emerald. Other towns on the itinerary include Surat, Roma, Injune, Rolleston and Springsure. On this fascinating journey you’ll cycle through some of Australia’s most spectacular landscapes, past sandstone cliffs, through ancient cycad forests and alongside rolling grasslands. - three night stay at Carnarvon Gorge Wilderness Lodge. - visit one of Australia’s finest examples of Aboriginal stencil rock art. Guests have the option of joining the tour in Roma for a shorter eight-day tour alternative. You’ll be struck by the Mulga difference. All of our bike tours are achievable by the average cyclist with a focus on the journey, not on the clock.